My soldering iron of 4 years bit the dust last nite. It was a 35 watt Radio Shack and it will be missed. The tip became perma fused and simply broke off when I was trying to twist it. However it was its time. 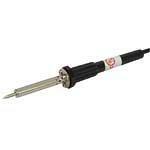 Enter the $2.99 Jameco 35 watt soldering iron. The first impression ofcourse is cheap chinese construction, yet sturdy and small. Perfect for small electronics. The tip is nice and sharp, doesn’t wobble. The cord is about 4 feet. It fit very well into my soldering stand. However did seem kind of small in it. The heating time was very short. Probably 1 minute before it was ready to go. The new iron fumes quickly filled the workstop. After a succesful evening of soldering I have this conclusion. Its OK, the biggest and possibly a major problem with this stick is that it gets HOT in the area where you typically hold it. Possibly due to it being in the holder and all the heat traveling upwards. Solution, hold further out or come up with some sort of thermal insulation around the holding area. Another easy thing to try would be to angle the iron holder further down so the heat has a chance to escape upwards before it heats up the handle. All in all very happy with the $2.99 stick. I’ll just have to see how many soldering hours I can rack up on this cheapy. Previous PostWhat toy megaphones are really made ofNext PostColdheat!